You can still buy a Ford F-150 with a 5.0-liter V8, but the top-shelf engine option is the 3.5-liter V6 EcoBoost. Yet I still hear stuff like– “will that fancy-pants tech really last?” Take this tour of a turbo F-150 with 205,268 miles on it and see for yourself. Truck guys are some of the stubbornest enthusiasts on the road, myself included. We like V8s cause that’s what our daddies had and their daddies before them, okay? And they just sound so good. When Ford introduced the EcoBoost-powered F-150 in 2011 it was met with a healthy heap of skepticism, mostly surrounding both long-term survivability and exhaust notes. Check any truck forum today and you’ll see that this persists in a decent-sized subset of vocal fans. Five years later Ford insists everybody loves the EcoBoost and it’s great and wonderful and the best. I have to say, I’ve been impressed with its performance myself and even though the 3.5 EcoBoost is completely redesigned for 2017, there were something like a million trucks made with essentially the same engine we’re seeing in this video. And what an engine– over 200,000 on the clock and it’s not even leaking! 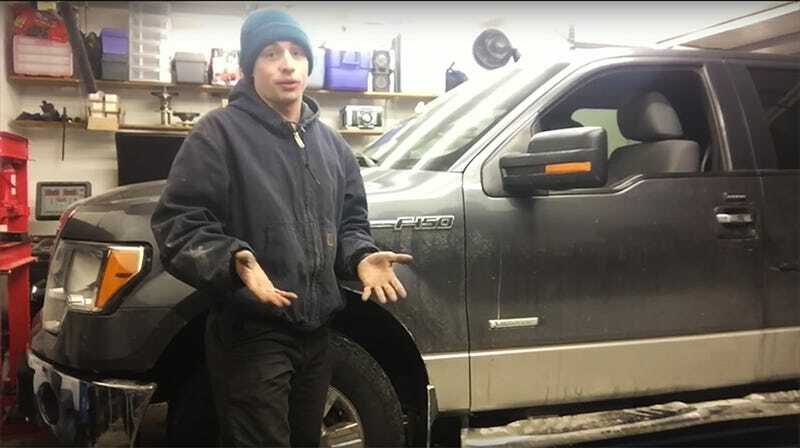 Our host in the here clip, who appears to be a mechanic regularly employed by this truck’s owner, says this 2011 F-150 is on its original engine, transmission, transfer case, axles and differential. None of which are seeping, he claims. The only repairs he cites are basic: brake rotors, two spark plug changes, an ignition coil change, a few oxygen sensors and a battery. The truck’s trip computer claims its made an average 20.2 mpg over its last 3,100 miles, which frankly, is also pretty impressive for a half-ton truck. Those miles don’t appear to be to the mall and back either! The rig apparently does full time duty as a construction worker’s daily driver. But despite a few battle scars and one seriously exhausted driver’s seat, the truck really looks solid. And is that road salt I see on the side? So the question is– is this a special survivor or are these trucks just that good? As the mechanic on camera points out, regular maintenance has undoubtedly been a huge factor in this truck’s successful life. It sounds like the owner of this machine has kept up with fluid changes that’s allowed this EcoBoost engine to run strongly under an aggressive duty cycle. If you take anything away from this video, it should be “take care of your cars before they break” and they probably won’t. Get it? I think this clip is also a pretty solid Ford ad. I’d love to see the results of a dyno test next!